As new kit sponsors for the Chesham Grammar School girls football teams we couldn’t be prouder of their latest achievements. This season has proved more than fruitful for the girls. They finished the season by scooping the top football trophies and winning all three of the Buckinghamshire Schools’ FA County Cup Finals in March 2019. The Under 13, Under 15 and Under 16 CGS girls’ teams coached by Tom Finch had a clean sweep of wins against their opponents. They are once again Buckinghamshire county champions. This follows County Cup wins for the CGS Under 13 and Under 15 girls in 2018 and the CGS Under 13s in 2017. Playing against Wycombe High School, the CGS Under 15 girls led by captain Catherine Reeves took an early lead and went on to win their match 6-0. Megan Maddison scored a hat trick for Chesham. Defender Izzy Bricheno was named Player of the Match. The Under 13 girls then went on to defeat Dr. Challoner’s High School by 6-1. Amelia Bloom scored a hat trick and was named Player of the Match. This same team progressed to the semi-final of the national school football Cup a week later, where they ended their run. The Under 16 match was a close game against Shenley Brook End School from Milton Keynes, with a 1-1 score at half time. With the support of the fans and the CGS Under 13 girls who had just won their match cheering from the sidelines, a second goal was scored with 20 minutes to go. This gave the CGS girls a 2-1 win led by captain Izzie Kidd. Catherine Reeves named as Player of the Match. 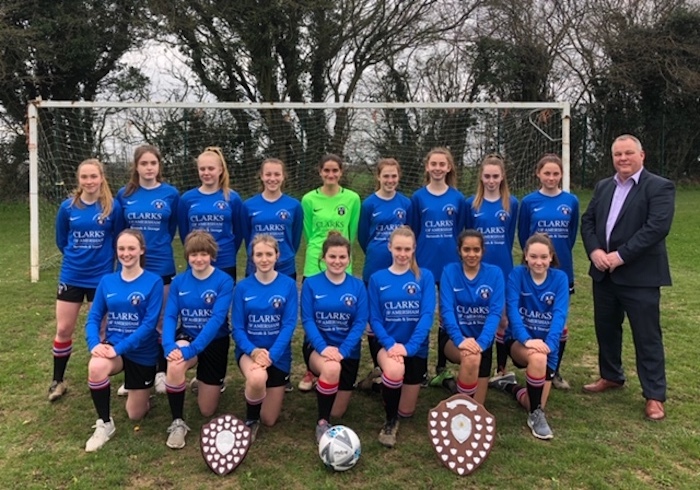 Izzie Kidd of the Under 16 team and Anna Bayles of the Under 15s said, “All the girls are very happy to be County Champions, and some of us for the third time!” Chesham Grammar School girls end their 2019 football season on a high, and looking forward to next year. Congratulations to all of the teams and we are looking forward to seeing them continue to win next season.